I’m really, really glad I never watched the telesnaps or read the novelization of this story so that I could come to it fresh. It climaxes in a fantastic and grim final episode that sees the Daleks gunning down lots and lots of humans, their usefulness at an end. Janley and Lesterson are among the casualties, and Lesterson, by now totally insane, gets a triumphant last line before he gets gunned down. This was our son’s first exposure to something so violent, and he was wide-eyed, absolutely stunned, when we could see his eyes anyway. He was curled in a ball on Mommy’s lap, ducking under his blanket. He completely loved it and so did I. This serial completely lived up to the hype. There are a few bits from the original production that you can believe would have been improved with a greater budget – like so many Doctor Who stories, we’re asked to believe in a very large colony despite the appearance of just a few sets and a handful of actors – but David Whitaker’s script was razor-sharp, and it was just a joy watching the malevolent, scheming Daleks consolidate their power. We will be skipping the next two DVDs that are available, “The Underwater Menace” and “The Moonbase,” in order to start in on the next serial that exists in its entirety, and will begin that soon. That means that these cartoons will be the last we’ll see of the characters Ben and Polly, who are among my favorite of all the Doctor Who companions. Sadly, Michael Craze died at the stupidly young age of 56. He didn’t have very many acting jobs following this, and largely left the business in the eighties and ran a pub. Craze had a bad heart, and died the day after seriously injuring himself falling down some stairs. Anneke Wills, an icon of Mod London, later co-starred with Anthony Quayle and Kaz Garas in a really good ITC adventure series, Strange Report, although her role was, in my book, nowhere as large as it should have been. Wills left the business in the seventies and moved to a monastery in Asia for something like a decade. Since returning to the UK, she’s appeared at lots of conventions and does occasional fan-instigated projects and documentaries about Who, and is still breathtaking at age 75. “The Power of the Daleks” is available on Region 2 DVD. It’ll be out in Region 1 in 2017, with a Blu-Ray to follow. It’s definitely worth buying! How interesting. Last episode, I didn’t quite catch that Janley and Bragen’s subplot scheme is that these two are the leaders of the rebel movement. This time out, they’re pretty close to taking over the colony. The Doctor, Ben, and Polly are all apprehended – actually, Polly is absent from this episode entirely to give actress Anneke Wills a week off, something that happened in Doctor Who frequently in the black and white era, when it was on the air about 46 weeks a year – and Lesterson has been having second thoughts about trusting the Daleks. He is slowly, but surely, completely cracking. And Janley is a hugely effective villain; it’s a shame that she has been overlooked in the canon of great bad guys. Lesterson’s realization that the Daleks can’t be trusted leads up to one of the show’s most famous cliffhangers. It’s a long sequence where we see that inside the Daleks’ bigger-on-the-inside capsule, there’s a factory where the Daleks are making more of their kind. It’s fantastic, really creepy and effective. On the one hand, I like the way the animation team preserved the sometimes hurried nature of the production, even having an off-center label on a bank of dials underneath “voltage” and “watts,” but I really like the way they’ve made a big room full of these CGI-animated Daleks, without a photographic blowup among them to beef up their ranks. I absolutely prefer the Daleks of the sixties to any of their later incarnations. They’re nowhere close to being as powerful as they’d be depicted later, and so they rely on cunning, treachery, and manipulation to get the job done. They prey on the scientist Lesterson’s greed and lust. The colony’s governor can only see as far as the short-term gains of a better production run in the local mines. There’s a fun subplot involving Lesterson’s assistant and the new deputy governor (played by Bernard Archard, who’d later impress in “Pyramids of Mars”). It turns out that the assistant, Janley (played by an Australian actress, Pamela Ann Davy), isn’t just around to pass Lesterson his test tubes and tell him how brilliant she is. She’s dumped another assistant’s dead body into a mercury swamp and told her boss that the fellow is ill! We can guess that their evil scheme is only going to go so far before the Daleks’ plans will crush it, but I like it when the Doctor has more than one mess to handle. This episode doesn’t have the brilliant cliffhanger that the previous one did to end on a big high note, but our son was attentive and interested all the way through. It’s really well paced; every time the middle-aged men in pajamas threaten to get too dull and grownup, the story brings the pretending-to-be-subservient Dalek back into the action to keep kids focused. This is good stuff. WOW! Episode one may have been interesting but slow, but this is downright amazing. As an animation, it’s still creepy and menacing and tense, with a fantastic cliffhanger ending. The original must have been one of the program’s greatest single episodes. Its destruction is a crime against art. So… what’s up with it being destroyed in the first place? I can’t speak for British viewers of around my age, who grew up never expecting to see old programs like Doctor Who repeated, and probably responded to the news that lots of them didn’t exist anymore with an unsurprised shrug, but the usual response from Americans learning that big chunks of old British TV history just plain got wiped and are missing is one of utter bafflement. Since we grew up understanding that if a favorite show wasn’t being repeated now, it probably would be back again pretty soon, this just flat out did not make sense. And yet it actually does, given the circumstances: the BBC, unlike American networks, functioned as a creator, distributor, and broadcaster, with a heck of a lot more time to fill each year than ours, who leave most of the daily schedule to their regional / local affiliates and just deliver news and two or three hours of prime time each night, programs made by studios and production houses. British viewers in the 1960s and 1970s expected nothing to be repeated; there was a cultural understanding that the BBC was supposed to produce and screen new programs. Repeats weren’t appreciated. In large part this was because of an agreement with Equity, the British actors’ union, regarding fees for repeats. Equity’s leaders were understandably concerned but incredibly shortsighted, and envisioned a future where new TV drama simply was not made in favor of repeats, so, in most cases, any production could be repeated exactly once with no charge, but high royalties kicked in after that, and a third screening would end up costing the BBC more than a new show entirely. So old shows didn’t get seen again at home, and after a few years in the catalog being sold to New Zealand, Nepal, and Nigeria, sales dried up and eventually the BBC found itself sitting on thousands of film reels and tapes, in an era before home video, which weren’t going to be repeated, and which weren’t selling to other countries anymore. It’s a huge shame that old shows got junked, but be practical. They couldn’t predict the future and they had new programs to make. The BBC junked thousands of hours of material from dozens of series, as well as one-off plays, TV movies, music shows like Top of the Pops, sports, you name it, pretty much everything except the Queen’s coronation was eligible for destruction. The commercial companies followed suit: Southern junked dozens of episodes of Freewheelers, and Thames wiped the first two seasons of Ace of Wands. The Associated British Corporation deleted almost all of the first 26 Avengers episodes. Not a single episode of a “footballers’ wives” soap called United! exists – 147 episodes, gone forever. Anyway, 130 episodes of Doctor Who – 130 of the first 253 episodes – were lost by the time junking stopped in 1978. 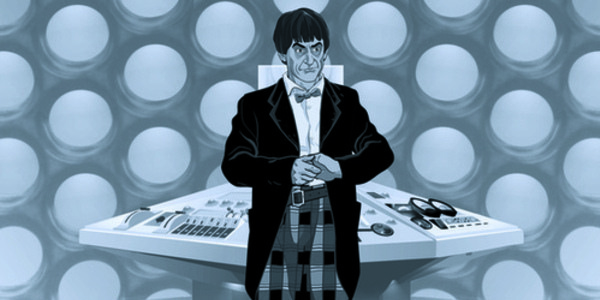 In addition, the color versions of about thirty of the 128 Jon Pertwee episodes were unavailable / not of broadcast quality / missing outright when BBC / Lionheart started syndicating his era the “second time around” in the late 1980s – more on that a few months from now – but black and white copies were available. The six parts of “The Power of the Daleks” are among 97 episodes of Who that don’t exist, but audio recordings all of them, thanks to enterprising fans like Graham Strong with good equipment, have survived. 13 of these 97 now exist in cartoon versions, and everybody keeps their fingers crossed that (a) more lost episodes will be recovered, and (b) sales for the animations are good enough to warrant continuing doing these for more stories. So do drop BBC America a line and thank them for ponying up some of the budget for this version. We’d love to see another old story animated next year! Some great news was announced yesterday, readers. On Monday, November 14, Fathom Events will have a special screening of the six-part Doctor Who serial “The Power of the Daleks.” This is the new, animated version of the story, which the BBC seem to have ditched around 1974. We don’t know yet whether Fathom is bringing it to Chattanooga, but we’ll be there if they do! This actually has worked out surprisingly well for us. Doctor Who was actually scheduled to join our rotation in a couple of months anyway, so this will be a really neat introduction to the show for our son. And if you’re wondering why in the world the BBC discarded episodes so that animation has had to be used, Wikipedia‘s got some background you can read. See you in theaters!